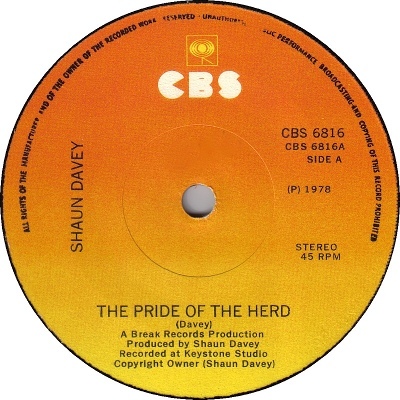 Pride of the Herd was composed by Belfast born composer Shaun Davey for an advertising campaign by the National Dairy Council of Ireland in 1978. It was used in their TV adverts at the time. Such was it's impact that it was released on single by CBS Records in late 1978 and become a hit, peaking at #7 in the Irish charts in December. It's a very well known piece of music in Ireland. Initial copies came with an attractive picture sleeve. 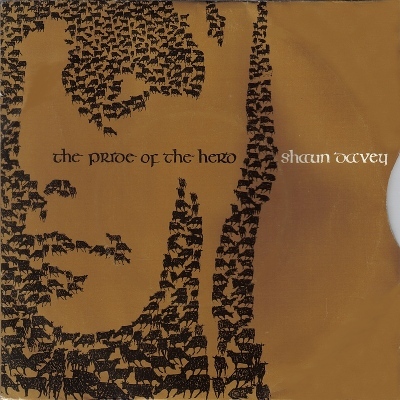 The A-side showcases Davey's mastery of arrangement of traditional music elements, not forgetting his ear for a melody. It recalls O'Riada and is obviously a forerunner of Davey's subsequent large orchestral works of the '80s and '90s, all of which draw heavily on traditional music. 'The Pride of the Herd' has the great advantage of being much shorter. It's a fantastic piece. It may come as a surprise to learn that the B-side is a piece of modern experimental electronic music which includes environmental recordings made on an Aer Lingus flight. It seeks to simulate plane flight in sound and is a very successful piece. It might put you in mind of File Under Pop's Heathrow EP [Rough Trade] which came out a year later. It must be one of the earliest electronic pieces released commercially in Ireland, alongside Roger Doyle's 'Thalia' LP released the same year. There is no studio credit (the A-side was recorded at Keystone) which suggests it was a home-made DIY project, perhaps even a student piece. Too bad the Strange Passion compilers didnt consider it. One interesting note: both labels state A Break Records Production. This same text has been spotted on a sticker affixed to early, promo-only 7 inch copies of the first U2 single, and appears to be the same label and/or production company that Paul McGuinness established to release Spud's Kitty single in 1976 . . . which was produced by Shaun Davey.